The magnificent tower of a burger at Ledlow in downtown Los Angeles. Ledlow in downtown Los Angeles fires up an exquisite burger. Not a burger joint, but a very nice restaurant, Ludlow impresses with this magnificent concoction. We love eating in downtown Los Angeles and have enjoyed the other restaurants in the Ludlow family like Baco Mercat and Bar Ama. 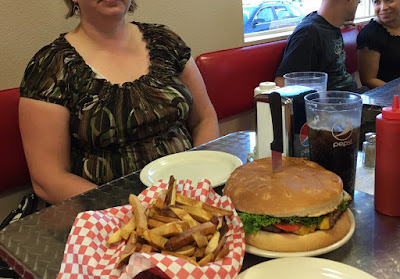 So when I ordered the 8 ounce double burger ($16), I did so with high expectations. They also offer a triple 12 ounce burger. The burger boasts a toasted poppy-seed bun. The spicey garlic aoli mayo sauce is yummy and combines nicely with American cheese. The burger had the right amount or Lettuce, but a little too much raw onion for my taste. There were tasty pickles as well. The bacon added a smokey note. The two beef patties were thick and juicy - cooked medium well. They burst with a nice griddled peppery flavor. High ceilings and space create a nice atmosphere for burger munching at Ludlow in Los Angeles. The fries were steak-sized with dill and salt. Hot and yummy. Not mealy in the middle like a lot of big fries. Make sure if you go to have the Parkerhouse rolls before the burger as an appetizer.